Have you ever paid close attention to Nicki Minaj’s makeup? With all that she has going on sometimes with her outfits and hairstyles, it can be easy to miss. If you ever happen to focus long enough on her face you’d notice how gorgeous her makeup could be at times. Perhaps one of the most note worthy aspects of her makeup is her lip stick. 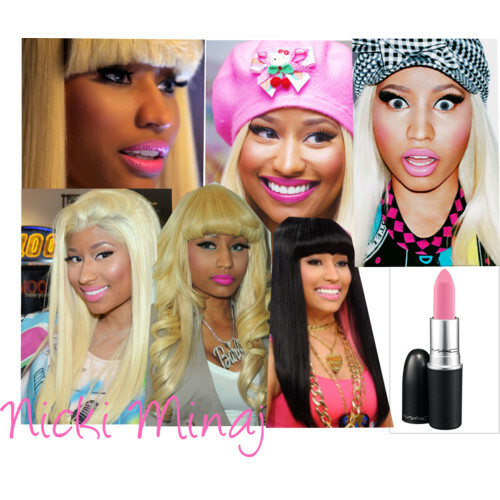 A color that is significant with Nicki is pink, which might explain why she has her very own pink M.A.C. lip color. Yes she does! It was released around the same time that the singer released her Pink Friday album and get this, the lip color is called Pink 4 Friday. Recently she teamed up with M.A.C. again along with Ricky Martin to create VIVA GLAM a limited edition lipstick that all sale goes towards helping women, men and children living with and affected by HIV and AIDS. Besides her lips, my favorite aspect of her makeup are her lashes. At times they can be very bold but they always complement her look. Bold lashes can be achieved by either adding eyelash extensions or by applying your favorite mascara. Lashes make a big difference to your finished makeup look, try some and you’ll see. Tip: Candy pink lips look best in matte lip shades with a little gloss added. Revlon and L’Oréal also carry matte lipsticks in a range of colors. Have you tried this lip trend? THIS SITE CLAIMS NO CREDIT FOR ANY OF THE IMAGES FEATURED ON THIS BLOG UNLESS OTHERWISE STATED. ALL VISUAL CONTENT IS COPYRIGHT TO IT'S RESPECTFUL OWNERS. IF YOU OWN THE RIGHTS TO ANY OF THE CONTENT AND DO NOT WISH THEM TO APPEAR ON THIS BLOG PLEASE CONTACT US, PROOF INCLUDED AND THEY WILL BE PROMPTLY REMOVED.